Locate and open the entry details view the for the specific entry to be licensed and released. You can locate a specific entry from either the managed entries view or the entry catalog view. Click the Add License Agreement button. DBL will open a license agreement grant configuration window. The window contains three vertical sections. The first two (Entry Name and Owning Organizations) display information about the entry being licensed. This is a confirmation to the licenser of the entry they are creating a license grant for. The third section (New License) is used for configuring the details of the license grant. An IPC might also grant (or decline) a license agreement by responding to an access request initiated by an LCH organization. When an LCH initiates the licensing workflow through a request, the IPC member(s) with Licenser role will receive an email notification alerting them to the request, and with a web link to the license agreement grant configuration window where they can configure the license (below), or decline the request. An IPC or LCH licenser can also review the status of or take necessary action for any access requests or grants from the Requests tab available from within the organization administration interface, or via the API. DBL also displays the number of pending agreements for each entry in the managed entries view displayed on the Entries tab. Select the LCH partner organization the license grant is being delivered to. Select the licensing document you wish to use for the agreement. Specify an expiry date (duration) for the agreement. For the current process of licensing content to a specific LCH, ensure that you have NOT selected the option to “Make Open Access”. See the section on Releasing Content for Open Access for details on open access distribution. Click the appropriate checkboxes in order to set the Content Options for the agreement. In the case of DBL text entries, Content Options include Introductions, Footnotes, Cross-References, and Extended Notes (study content). 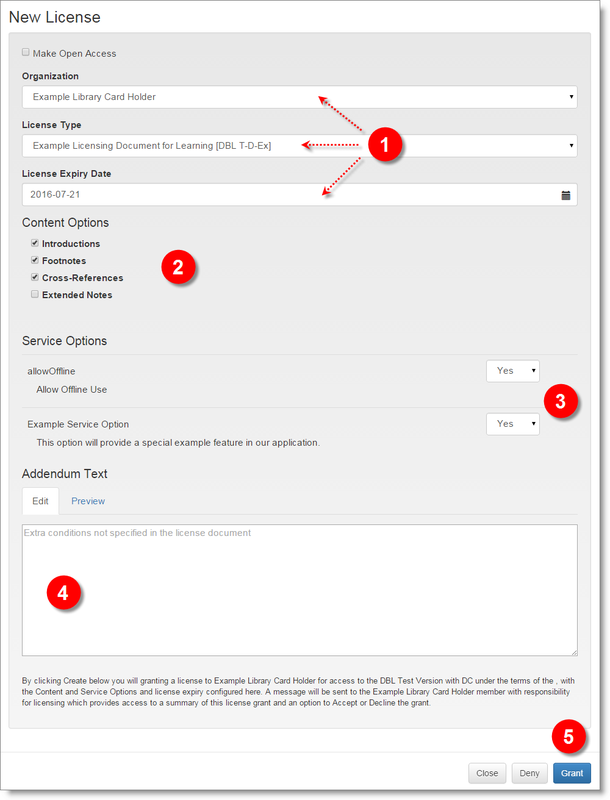 Selecting these options not only specifies the content which the LCH is permitted to publish, but also results in DBL removing content which is not included in the agreement from the download bundle made available to the LCH. Configure the LCH’s configurable Service Options. Service Options are optional or configurable features available within the selected LCH’s publishing system. The LCH has requested Yes or No answers to these questions in order to fully configure the use of the IPC text within their environment. The “Allow Offline Use” question is common to ALL LCH organizations. (Optional) Enter any additional Addendum text required in order to clarify or adapt the terms specified in the selected licensing document. When the New License section is properly configured, click the Grant button at the bottom right of the window to notify and deliver the license grant to the LCH partner. Click Close to cancel the New License grant process. If the license agreement grant configuration process was initiated by responding to an access request, there will also be a Deny button visible at the bottom right. If appropriate, click Deny to decline the request and terminate the access request process. DBL will send an email message to the requesting LCH organization member(s) with Licenser role to indicate that the request was denied. If a grant is made, DBL will send an email notification to the user(s) who has Licenser role within the LCH partner organization. The email notification will contain a web link which will deliver the LCH member to the DBL and the next step of the license agreement process. In the grant acceptance window, the LCH member will be presented with the terms of the grant, and with an option to Accept or Decline the grant. If the grant is accepted by the LCH, the the license agreement is established. A record of the agreement, and the actions within DBL which established it, will be visible to either IPC or LCH from the organization administration interface Agreements tab. See: Publishers > Licensing for more specific details on the licensing workflow as seen from the perspective of the LCH. © Copyright 2018, United Bible Societies.